Never mind heading south. Who needs a tropical vacation when you live in a winter paradise? 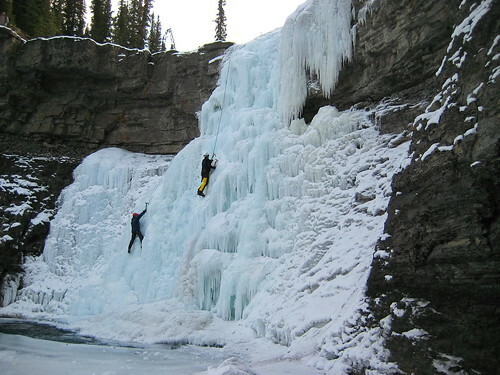 Don’t miss your chance to explore some of Alberta’s parks this winter. Always check with the park or campground in advance to see what services are available, apply for fishing and backcountry camping licences, and pack enough gear for all weather conditions, as circumstances can change quickly. The best way to start an unforgettable adventure is by being properly prepared! (only Alberta Provincial Parks are listed below). All 5 National Parks (Banff, Jasper, Waterton, Elk Island and Wood Buffalo) in Alberta are great winter destinations. 16 kilometers northwest of Rocky Mountain House. Discover Crimson Lake (named for its brilliant sunsets) as you loop around the 10 kilometer Amerada Trail. Take a break on the benches or shelters that line the trail and offer a scenic view of the frozen lake, or visit the playground. After hiking, fishing, snowshoeing or skiing, make camp at one of the winter campsites. Amenities include: Winter camping/Powered campsites/Pit/Vault winter toilets/ Fire pits and picnic areas. Explore this park in southwest Alberta on snowshoes and experience Alberta winter in all its glory as you discover snowladeb landscapes of stunning mountains, and montane meadows. Syncline Cross-Country Ski Area has packed and classic tracked ski trails, between the South Castle and West Castle rivers. Join Alberta Park Staff for snowshoeing under the starlit sky with a guide (Snowshoes and red headlamps are provided). After your adventure try winter camping. Make sure you bring your own locally purchased firewood, (or cut your own with a Castle Tree Cutting Permit), and drinking water! Try to spot finches and crossbills in winter, enjoy cross-country skiing at 30 km groomed ski trails, ice fishing and more at this park. Alberta Parks & Lac La Biche Ski Club holds Moonlight Night Ski & Moon and Star Gazing Tours where one can ski, walk, or snowshoe in the moonlight and enjoy a night outdoors! No winter camping. Nestled amongst the foothills of the Rocky Mountains, this protected area is over 42,000 square acres. Mountain views, birdwatching, and wildlife sightings of grizzly bears, cougars, bighorn sheep and harlequin ducks. Wear your sturdiest hiking boots, snowshoes, or bring your horse to ride through the trails. Get back to wild nature with backcountry hiking and camping. Head to the Boreal Center for Bird Conservation, which also doubles as the visitor center in winter. If you don’t have your own pair of skis or snowshoes, you can borrow them here! The park has over 18 kilometres of groomed ski trails, forested areas and snow covered fields for snowshoeing. If you’d rather sit and catch your dinner, carve a hole in the ice and grill your fish over a crackling fire. No winter camping available. Icy glaciers, rugged mountain tops, fast moving rivers and over 750 kms of trails spread out over 4500 acres of wilderness. Take a deep breath of cool, winter air as you explore rocky summits or snow covered valleys. Snowshoe through the Resthaven icefield and marvel at how the mountains were shaped over time. Stunning hoodoos and towering rocky spires make up the geography at this Unesco World Heritage Site. Bring the family to explore the many educational and theater programs offered at the visitor center, shop in the gift shop, hike the trails, or play in the playground. The park offers guided hikes throughout the winter, although participants must be over the age of 10. Amenities: Visitor Center, gift shop, payphone, wifi/Powered winter campsites/ Pit/Vault toilets in campground/ No water. If you’ve ever wanted to test your skills with a bow and arrow, the Brazeau Bowbenders archery Club is ready to show you the ropes with their fully equipped indoor and outdoor ranges, as well as forested archery trails. If you’d rather try another winter sport, head to the Pembina Nordic Ski center for groomed cross country ski trails with view of the Pembina River. Hike the 2.5 km trail and emerge into the Bighorn River Valley gorge. Huge layers of sedimentary rock showcase Crescent falls and the Bighorn River. At the end of the hiking trail is a lookout area with a railing that juts out into the river valley for stunning views. No winter camping, however there are several campgrounds nearby. Towering 2240 meters above sea level, the solid rock face of the Yamnuska (wall of stone) Mountain is famous as a landmark and also as a climbing spot, with over a hundred trails just on the mountain itself. Heart Mountain, Wind Mountain, and the Three Sisters mountains are nearby, making this park and ideal destination for anyone who loves the Rocky Mountains, or any kind of hiking or snowshoeing. Take your dog skiing at Beauvais Lake, dogs are allowed on all of the groomed ski trails. Afterward, ski, hike, or snowshoe through untouched powder to your winter camp spot in the trees, with views of the frozen lake. Enjoy winter fishing at Beauvais Lake and camp at the park. Aspen beach was established in 1932 as Alberta’s very first provincial park. Famous for ice fishing at Gull Lake (the park is located on the south shore of Gull Lake), its beautiful beaches and shallow waters, the lake is an accessible spot to enjoy a winter walk over the boardwalks and around the frozen lake surface. Perfect for day trips if you are looking to get out of the city and spend the day playing in a natural setting! Warm up around a crackling winter fire as you search the night sky for the Aurora Borealis and constellations in this dark sky preserve. Miquelon Lake is the perfect place to enjoy winter camping, or host your family reunion in the Aspen Center, which is equipped with a full kitchen and washrooms. Bring the dogs and hit the trails for Skijoring, snow shoeing, skating, or skiing. Bring the binoculars to catch a glimpse of woodpeckers, black capped chickadees, loons and many other types of birds. The park is also home to deer, lynx, muskrats, beavers, coyotes and bears. Bundle up for snowshoeing, ice fishing or snowmobiling on McLeod Lake. Enjoy excellent wildlife viewing, dog sledding and skijoring at the Blackfoot Lake Staging Area, fat biking, snowmobiling, and cross country skiing across 35 kilometres of groomed trail at the site of the annual Canadian Birkebeiner Ski Festival. Pigeon Lake Provincial Park is an ideal winter getaway with snow covered hills, pine trees, an expansive lake, and all of the amenities you could need. 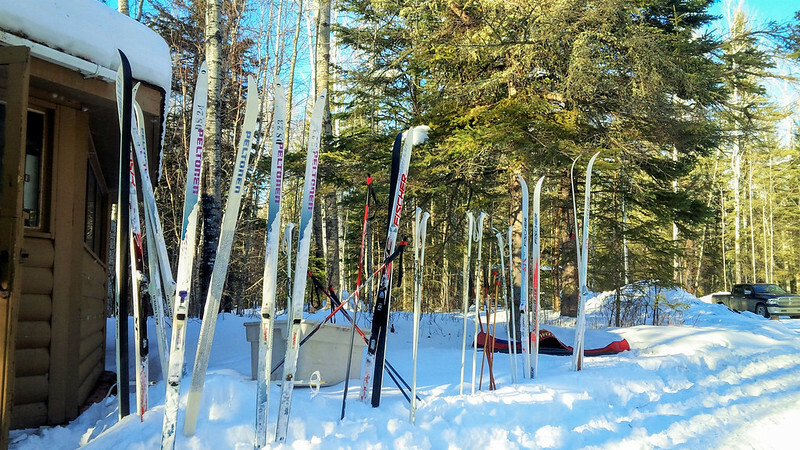 Glide over 12 kms of ski trails groomed by the Pigeon Lake Nordic Ski Cub, and then head to the Village at Pigeon Lake for a steaming cup of hot chocolate at the Eco Café. The Village has many restaurants, cafes, a pharmacy and a gas station. Powered Winter campsites are available at the park. Spend the night at the powered campsites after a long day of winter activities in the Vermilion River valley. Enjoy cross country skiing, fat-biking through snow covered oxbow lakes, or spend the day ice fishing at the lake. You can also join Vermilion Nordic Ski Club for various programs including Full Moon Ski. The Canmore Nordic Center was built to celebrate everything that winter is, indoor and out. A wheelchair accessible training center with a waxing room, work tables and power outlets, gym, athletic facilities, meeting rooms and event rooms ensure you’re every event or training need is taken care of. Outdoors, try the skating rink, biathlon, cross country skiing, snowshoeing, tobogganing, fat biking or winter disc golf. Try dog sledding at Spray Valley Provincial Park or camp at the Rummel Lake Winter backcountry campground among the pines, and relax around your campfire with views of Mount Galatea and Rummel Lake. Breathe in the cold mountain air as you play outside in the snow, watch for wildlife, or grill your dinner over a flame. Pierre Grey’s Lakes Provincial Park is named after a Metis man named Pierre Gris, who operated a trading post in the 1880’s and 90’s, along with his wife, Anne. The park is home to five beautiful lakes, two of which are stocked with Rainbow trout, and one with Brook trout. Hiking trails, picnic spots, and 15 kms of groomed ski trails amongst pine trees, in the Rocky Mountain foothills. For more details visit Alberta Parks.